Landlords own the rental property and some might think that they can enter it whenever they please. This however is not the case. A California landlord is not permitted to enter the rental property he has rented unless a written 24 hour notice is given that he will be entering the unit during normal business hours, or he has been invited in by the tenant himself. Having said that, there are certain situations in which the landlord is legally allowed to enter the rented apartment or home. The following are some of these situations. If the landlord is visiting the rental property for a routine maintenance check then he has every right to enter the premises. However, it is important that the landlord informs the tenant in advance that he will be coming over to take a look at the rental’s maintenance. Moreover, it is also necessary that the landlord chooses a suitable time to perform the maintenance check in the presence of the tenant. Usually a landlord can schedule routine maintenance checks after every 3 to 6 months. 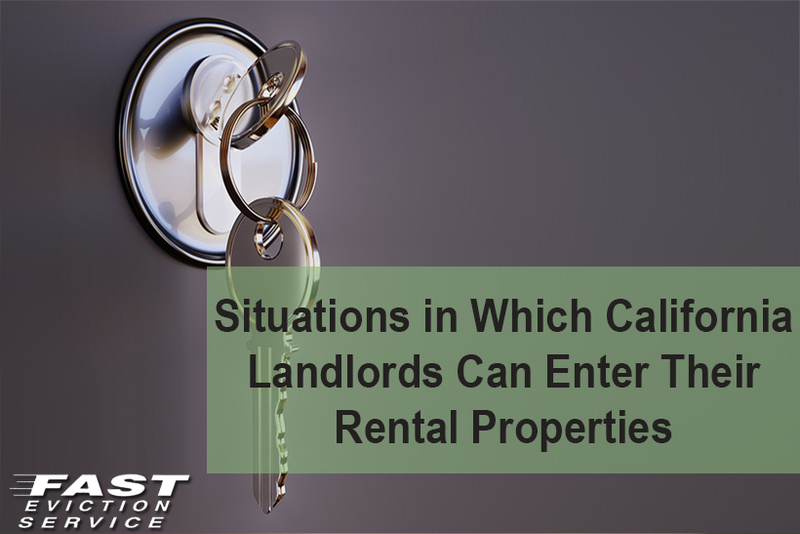 One of the situations in which the landlord can enter the rental property without asking permission or even notifying the tenant is an emergency. For instance, if the landlord spots a fire at his rental property or sees a water leak then he is well within his rights to rush over to there and take care of the issue. In such a situation it does not matter whether the tenant is present in the rental property or and the landlord won’t be considered to have invaded the tenant’s privacy. If the tenant has notified the landlord about some repair work that needs to be done at the rental property and the landlord wishes to come over to perform the repairs then in that case, the tenant would have to let him in. Moreover, if the landlord sends a repair worker to take care of the issue then again the tenant would have to allow him to enter the rental property. The landlord should inform the tenant in advance when he or his repairman would be coming over to perform the repair work. Another scenario in which it becomes legal is for a California landlord to enter his rental property is when he wants to show it to another prospective tenant or buyer. However, issues can sometimes arise when tenants try to prevent showings of the rental unit at the end of their tenancy. Know what you can do if the tenant doesn’t allow for viewings. The landlord must inform the tenant about his visit beforehand and schedule a fix time when he will be visiting. However, you must keep the tenant’s privacy in mind and hold the viewings .